Materials: Round metal base (iron). Brass, aluminium, iron. All painted in black wrinkle paint. Black plastic lid on the bottom of the base. 2 red plastic buttons. It features an adjustable glass lens making it ideal to highlight art work. 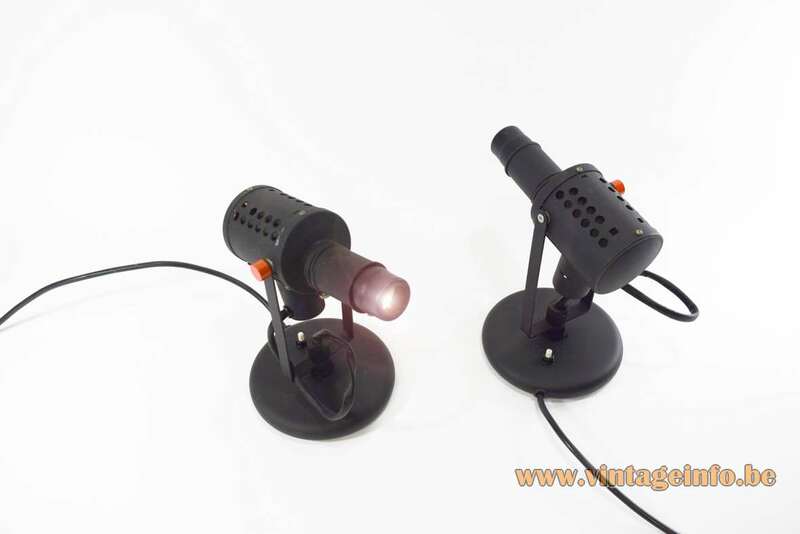 Electricity: 1 bulb Lita 77, 51 projector lamp, 75 watt, 110/220 volt. Manufacturer: Societé Lita Groupe Mazda, Lamotte-Beuvron, France. Other versions: Also made as a wall lamp. 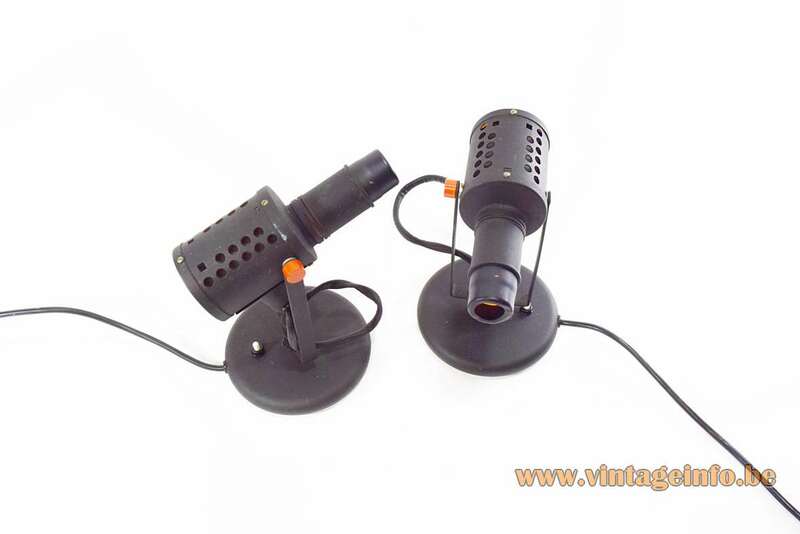 Lita was a French manufacturer of lighting and spotlights for gardening and interior lighting. 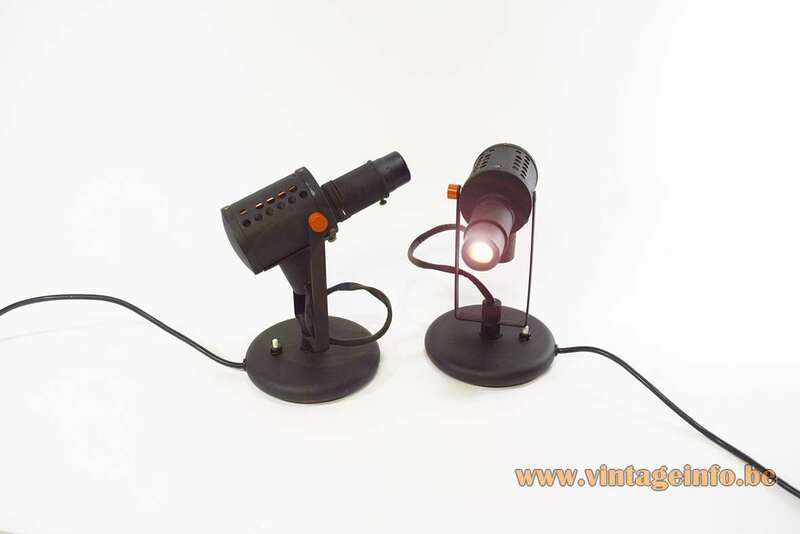 It was acquired by La Compagnie des Lampes together with Projelux in 1974. La Compagnie des Lampes was renamed into Mazda. The names Projelux en Lita were used for a couple of years. Prejelux made several Philips lights for the French market. In 2002 Philips merged with Mazda. The two brands still coexist, but the Philips products are presented in the catalog of Mazda and vice versa. From 2007, products previously sold (and labeled) as Mazda products are now sold and labeled as Philips products. In 2011, the brand Mazda Eclairage and its website, officially disappears to give place to the brand Philips. The name Mazda was for the first time used in the United States in 1909 by General Electric. 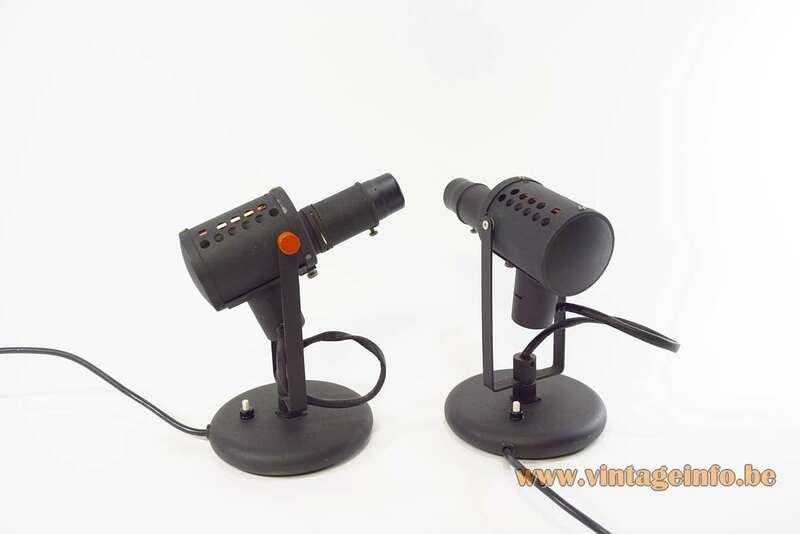 At that time the light bulbs were not standardized, a problem for customers whereby each lamp holder or each appliance corresponded to a precise type or lamp brand. General Electric therefore had the idea of creating a standard to which any company could adhere. Light bulbs manufactured from the specifications of this standard were marketed as Mazda lamps. Around 1920, many American companies, including General Electric and Westinghouse used the name Mazda to market their lamps. 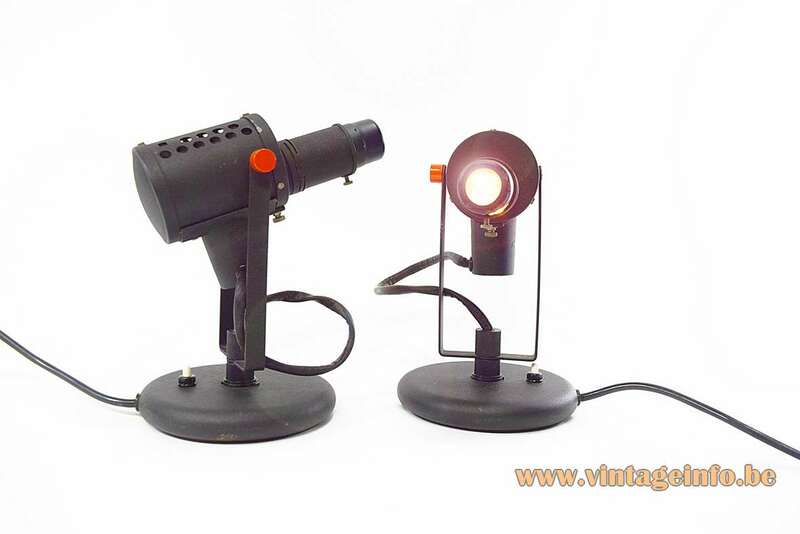 The famous French light designer Jacques Biny (1913 – 1976), designed several lamps for Lita such as the Zodiac wall lamp, also a type of projector lamp. This lamp is often attributed to Jacques Biny, but in all probability it is not. Some other designers that created lights for Lita were Jean Boris Lacroix and Alain Brux.